Peter Stone (aka Bat [dj/vj]) created the solo project Xorcist in Los Angeles, California circa 1988 as a means to musically exorcise the demons that plague our planet, our society, ourselves. 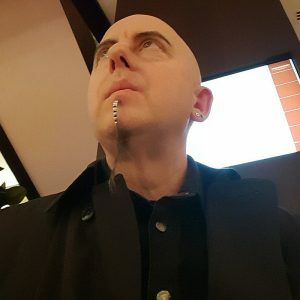 Over the decades, Peter as Xorcist (and his side projects XE:NON and Diode Fetish) released a variety of albums and singles on 21st Circuitry Records, Pendragon Records and Metropolis Records all of which are available on his bandcamp site today. Peter has scored various video games for the PC/MAC and various gaming consoles, has scored and had his music featured in several indie movies and has worked as an assistant sound designer/editor for MTV’s first seasons of Aeon Flux. During the mid 1990s, Peter was a partner of the world famous House of Usher nightclub where he managed, promoted, DJ/VJed, ran live sound along with whatever needed to tending to. He also ran various other nightclubs throughout the San Francisco and Los Angeles areas (Europa, The Black Lodge, Madeline’s Tomb, EROS), was a resident VJ in Hollywood and still guest DJ/VJs worldwide to this day.